Rubber shed roof kits are a brilliant alternative to corrugated sheeting or roof shingles. This is due to their easy installation and incredible durability, which allows it to handle the toughest of weather conditions when fitted correctly. 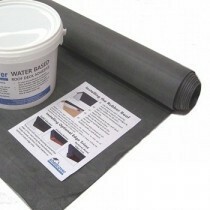 Our rubber shed roof kits include an EPDM membrane, adhesives and all the necessary finishing’s. Our shed roof kits also provide the necessary tools and installation guide, helping to make fitting your roof painless. If you have questions about our range of shed roofing kits, simply call our team on 01295 565565. We will help you find the perfect roofing kit for your shed and provide great pricing. With fast delivery across the UK, you’ll also be able to get your new roof fitted quickly.